In the PhotographyTalk Article, “You need more than Deep Pockets to Buy the World’s Most Expensive Lens—you need Deep Oil Wells,” the story of Sheikh Saud Bin Mohammed Al-Thani of Qatar was told. He purchased the Leica APO-Telyt-R 1:5.6/1,600mm lens for a bit more than $2 million. The Sheikh will have to find many more oil wells when he reads this article because if all goes according to plan, construction on the world’s largest digital camera will begin during 2014; and it makes the Sheikh’s lens look like a pop-gun. Known as The Large Synoptic Survey Telescope (LSST), it will be placed near the top of Cerro Pachon, a mountain in Chile, where scientists will start an unprecedented, scientific-shattering survey of the Southern sky during 2022. Thirty-six institutions are supporting the LSST project and many private sources are providing funding, including $10 million from Bill Gates. Another $400 million is expected in the form of a grant from the National Science Foundation. The Association of Universities for Research (AURA) and the National Optical Astronomy Observatory (NOAO) have been promoting the benefits of such an incredible astronomical instrument since the early 1990s. No wonder, considering The Large Synoptic Survey Telescope with the world’s largest digital camera is expected to identify billions of new objects throughout our galaxy and beyond. At 1,000 times more capable than any existing facilities, the LSST will also reveal more of the secrets of dark matter and dark energy. Some are even speculating that such a telescope, or a future generate of it, could make it possible to see planets in other solar systems well enough to determine if there is life there, and maybe even civilizations. First, some photographic specifications: the telescope portion of the equipment is 27 feet, 7 inches (8.4m); however, the companion digital camera will have a 3,200-megapixel, or 3.2-gigapixel, sensor. It will actually consist of a 25-inch diameter grouping of 16-MP silicon detectors. When working in tandem with the telescope, the camera will capture two 15-second exposures every 20 seconds that will result in approximately 20 TB of data every night. The LSST will have three mirrors or elements, a design that helps to control the distortion that would otherwise be produced. The first mirror is the one mentioned above, at 27 feet, 7 inches (8.4m), with the second mirror at 11 feet (3.4m) positioned behind the first. Then, the third mirror, at 16 feet, 4 inches (5m), is inserted in a hole cut from the primary mirror. This is where the science enters the picture, so to speak. 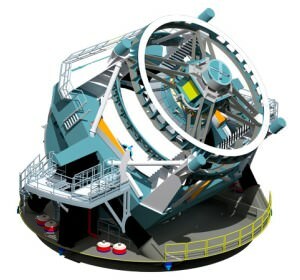 The LSST will provide scientists with a staggering 3.5-degree field of view. This may not seem like much, but the moon occupies only .5 degrees when viewed from Earth. The LSST will be able to scan a 20,000-square-degree section of the sky every few days, which calculates to producing images of every part of the visible sky almost 1,000 times during a ten-year period of time. Finally, the physical attributes of just the digital camera. It is described as being the size of a Volkswagen Beetle, at 5 feet, 3 inches tall (1.6m) and 9 feet, 10 inches long. It will weigh 6,173 pounds (2,800kg), or just a bit more than 3 tons. Maybe, the most astounding fact about the LSST is that the project will make available to the public a mind-blowing 60 petabytes of data in RAW files and 15 petabytes of cataloged data. For Sheikh Saud Bin Mohammed Al-Thani to buy this camera too, he will also have to calculate the cost of the mountain, since Qatar is at sea level and all that blowing sand would scar those mirrors after just a few hours of operations.